Biffy Clyro are clearly not embarrassed by jamming with I'm a Celebrity's Nick Knowles, as it apparently didn't ever happen. ICYMI: Nick was explaining to Croc Creek campers that he was signed to Universal Music to release an album after playing with an unnamed band on a Soho rooftop. "Probably best not to say who they are because it'd be embarrassing for them more than anything else," Nick told the others. His coyness didn't last long, as he continued: "I ended up playing with this band. Actually, they won't mind! They're nice lads. It was Biffy Clyro." Anyhoo, the band themselves have set the record straight on the DIY SOS presenter's claims that he had a bit of a jam session with them on a Soho rooftop, which led to a record deal, and it seems Nick may have been "playing fast and loose with the truth", according to the band. "It was more like eight years ago," Biffy Clyro drummer Ben Johnston told Radio 1 Breakfast with Greg James. "It was after an award ceremony. We went back to this hotel in Soho. And we were informed Nick Knowles has bought us a bottle of champagne to celebrate on the roof. "It was lovely we had a drink and we left. There might have been a guitar there. That's about as much as I can give you." While they don't appear to be lining Nick up for a support slot anytime soon, Ben did joke: "It would be quite handy if he could help us put up the stage with his amazing carpentry skills. We'll definitely keep his hat in the ring." He further explained: "He was a nice guy, I'm not going to say anything bad about him. I don't think it's quite the 'Kum Ba Yah' situation everyone has in their heads at the moment. "I'm really sorry to shatter the illusion everyone has that we had a proper heavy jam with Nick Knowles, because that didn't happen I'm afraid." 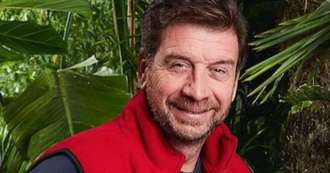 Following Nick's I'm a Celebrity anecdote, co-host Declan Donnelly managed to get Biffy Clyro trending on Twitter after the DIY SOS presenter said it would be "embarrassing" for the band to have jammed with him. Still, we guess Nick is having the last laugh, as he's rocketed to Number One on the iTunes chart.